I was a big fan of 2012's Sinister as I find Scott Derrickson one of the most effective horror directors today and am somewhat disappointed to hear Focus features would be going forward with a sequel to the film without him. Instead, they handed the reigns to director Ciarán Foy whose prior work I have no knowledge of and his last film, Citadel, sits at a 56% on Rotten Tomatoes. Of course, Sinister only sits at 63% and I would easily rank it as one of the top ten horror films since the dawn of the millennium. It should also be noted that Derrickson along with original scribe C. Robert Cargill again collaborated on the script for the sequel so at least we know the story will continue in a way that the makers of the original saw fit. As for this first look trailer while it does contain some generally disturbing imagery and I like seeing James Ransone back and reprising his role as the Deputy that seems to have more to do this time what scares me (and not in a good way) is the amount of screen time our main antagonist gets. The first film was smart and skillful about not divulging the physical form of Buhguul, but instead kept him to more of a presence that in the end upped the creep factor all the more. In this trailer he is all over the place (just look at the screen grab below) and so I'm really hoping the effect isn't lost on showing too much of the baddie this time around. Naturally, I'll still see the film and will remain optimistic given my affinity for the original, but I don't know that I'll be surprised if I come out wanting to pretend this sequel didn't happen. Joining Ransone are Shannyn Sossamon, Tate Ellington, Nicholas King and Robert and Dartanian Sloan. 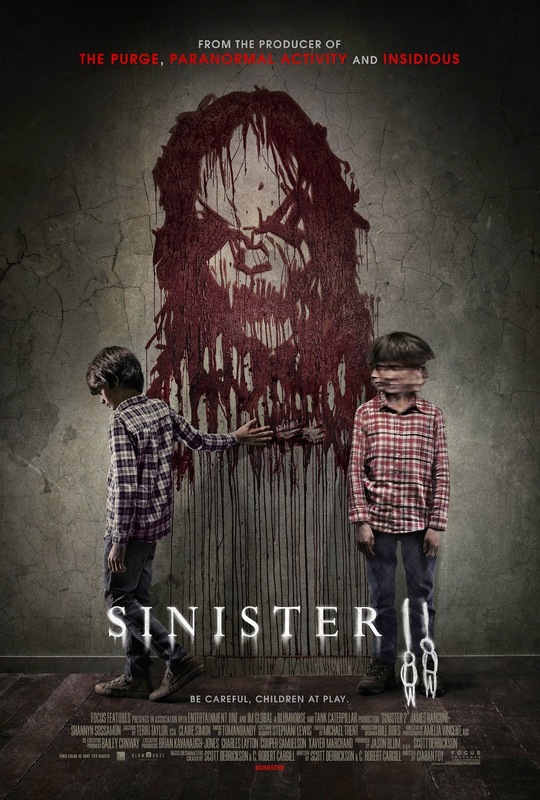 Sinister 2 hits theaters August 21st.